Does the death of a great author affect his or her value to collectors? In some cases the author's values (and reputation) can take a dip with the person not around anymore to fight their corner--this may have happened in the cases of Mailer, Updike and even Bellow. Harold Pinter's prices have not been helped by his Nobel Prize, his demise or even a superb London production of 'No Man's Land.' Movies don't necessarily help either even with Oscars thrown in. In the short term with Salinger there is now a fast sale of lesser items and some modestly priced books that had been around for a while have at last started to shift. The online mall ABE record January sales of a decent Catcher in the Rye at $8000 and an amazing $6500 for his Nine Stories (1953). Catcher can make into 5 figures for impressive copies but Nine Stories must have been an exceptional copy or some punter, in his grief, hit the Buy it Now button and swallowed the price. Otherwise high end and overpriced Salinger firsts, some of which have been around since the days of Dubya, are not selling any better than usual. Far gone chancers on Ebay are trying to sell Salinger related dotcom domains, one seller barks PREMIUM DOMAIN FOR SALE! WWW. JD Salinger Secrets .COM --SINCE HIS DEATH THE WEB HAS BEEN BUZZING! CASH COW!!! They need $25000 or best offer. Another optimist wants a modest $4999 for InMemoryofJDSalinger.com. Talking of dotcommers the greatest cache of Salinger letters to ever get near the market, letters to his young lover, the petite horizontale Joyce Maynard, were bought by the American inventor of a hugely profitable computer anti-virus software programme – he promptly made them over them over to Salinger as a gift. A quixotic but (from a dealers point of view) dull and painful gesture. As for the vexed issue of the genesis of the name Holden Caulfield, Joyce Maynard (not especially liked by Salinger diehards) says that he got it from a movie marquee hoarding for the Joan Caulfield and William Holden movie Dear Ruth (1947). 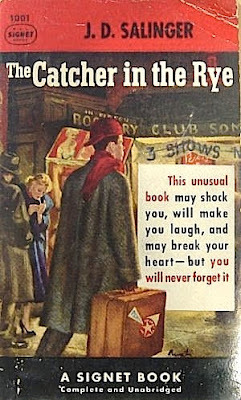 The problem is that Holden Caulfield is mentioned in Salinger's short story Last Day of the Last Furlough in the July 15, 1944 issue of the Saturday Evening Post, three years before Dear Ruth , but the Caulfield name, including a mention of Holden, appears as early as the unpublished 1942 story The Last and Best of the Peter Pans. A well-known (ish) Canadian seller wants $55,000 for a signed 1952 reprint. Not at all! When I see a ridiculously overpriced book being touted by such a so-called bookseller, I tend to LOL, curse that person to an eternity of agonising haemorrhoids and strike that want (if it is one) from my list since you know that other booksellers - and I use that term loosely - will use that price to overprice their own copies accordingly. Hey Dogeared, that's not very nice! Some of those booksellers you refer to may not be 'booksellers' in the strictest sense, but 'book monks', reluctant or scared to sell any books because they cherish them too much - hence overpricing. Of course, some may also be clawing, ruthless businessmen dismissive of all book-sentimentalism. Generally, if you have a wish-list, I've found it beneficial to keep it in your brain - let no titles spill. J.G. Ballard. The Atrocity Exhibition, 1970.